I remember a few years back when the PS3 was released and I was hesitant to get it, mainly because Heavenly Sword was the only good game available at that time for the console. Eventually, Final Fantasy XIII came out and I decided to buy a PS3 because in routine fashion, all my PlayStation console purchases were centered on a specific Final Fantasy (FF) series, namely FF VI for PlayStation 1 and FF X for PlayStation 2. True to my principle, I bought my PlayStation 4 because of Final Fantasy Type 0, which had the playable demo of Final Fantasy XV that has been in development hell for over 10 years. 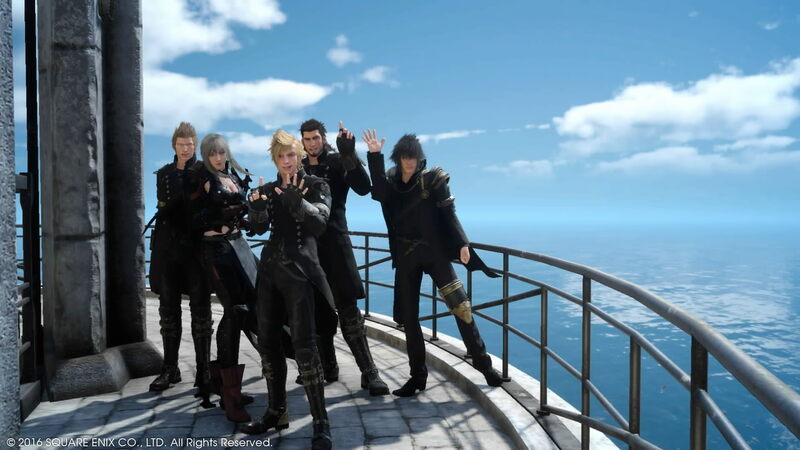 With FF XIII touted as one of the worst FF’s ever by fans worldwide, coupled with the massive marketing mechanism Square Enix (SE) has launched for FF XV (a full blown CGI movie and a 5 episode animation series), there was no way that FF XV would fail at launch, at least sales wise. I was still in high school when FF XV (at that time called Final Fantasy Versus XIII) was announced, and now I am well into my early twenties (may or may not be accurate). Having played all the entries since the first (except the online ones), with FF XV being the next main installment in the legendary JRPG series, I actually can’t believe that I have finished the game today. However, with that, comes a few important questions. Like, did it meet the fans expectations, was it a good game and finally, is it worthy of being called a Final Fantasy game? The answers are both yes and no, as I have mixed feelings about this title. I will layout the pros and cons of the game and based on your perspective and what kind of elements you prefer in the games that you play, FF XV can be a great game or a terrible one. Read on to find out. This game pushes the limit of what a PlayStation 4 graphic processor can do. The animations are drop dead gorgeous, stellar beyond words. Everything from the environment to the characters to the combat animation, right down to the spellcasting sequences are done with so much detail that I am assured that this is one half of the reasoning of why FF XV was stuck in developmental hell. Featuring wide rolling plains as far as the eyes can see, towering granite formations and ridiculously detailed monsters, you would have to be a backwater neanderthal if you find this aspect unappealing. Rounding out the animation sequences are the cut scenes of skyscrapers, airships and militarized weaponry, which possesses an uncanny photorealistic quality to it. Visually appealing combat tricks, realistic lighting, heavily detailed dungeons and cities makes this game a sight for sore eyes. 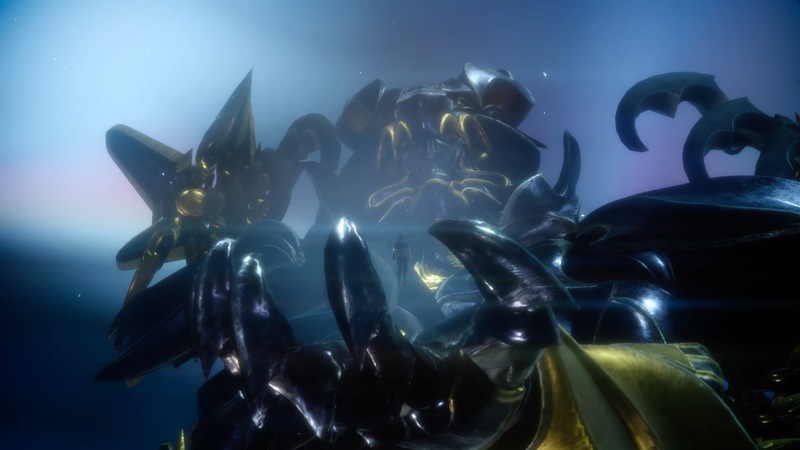 The most impressive animations of the lot (like any other FF game) are the Astral summons. You have to see it to believe it, as there are different animations for the summons based on where you are, and what your predicament is. Seriously, you’re not going to find a game more beautiful than this graphical masterpiece out there today. Verdict: Even a blind person can appreciate the graphics of this game. I will be very honest with you. Since the day I got my hands on this game, I have been listening the soundtrack of FF XV nonstop. I have Apocalypsis Aquarius, Apocalypsis Noctis and Omnis Lacrima on loop and I suggest that you should listen to it daily as well. The music in this game is one of best in the franchise, and that is high praise considering the number of iconic songs associated with this series. There is a fanatical emphasis on classical music here, but there is a great assortment of upbeat tracks, harmonious tunes and heart wrenching melodies that will keep you fascinated throughout the game. The background music changes from area to area, fluidly adapting to suit the atmosphere of the different areas subtly. For example, while traversing the desert, you will have a soothing track playing in the background and as you enter a small town or settlement, the music will gradually shift to that of a more jovial nature. The sound of weapons clashing against hide and scale, the warping ability of Noctis, the elemental spells and just about every other aspect of sound engineering related to combat is near perfect. During battle, your comrades will give you commands or suggestions verbally and this feels very real. Even when you are just walking around exploring the vast meadows available, the teasing between the 4 boy band members never feels forced and is very entertaining. The voice acting for this game leaves a lot to be desired, with the Japanese voice acting outclassing the English counterpart. The English voice actors did a decent job, but the real emotion was conveyed effectively by the Japanese voice actors. The English team paced their words very poorly with no real injection of sentiment into their work as compared to the Japanese team. Luckily, you can switch language preferences at any given time. Just for the record, I couldn’t stand Cindy’s southern accent, it just didn’t feel natural. Verdict: Arguably one of the best soundtracks created for a game. The previous two sections of this article are probably the only areas where most people generally can’t disagree upon. However, the following two sections will be deeply mixed, based on your preferences and expectations. Now if you have been a faithful FF fan like me your entire life, you will know that most FF games are turn based classic RPGs. FF XV departs from that old age tradition and bravely ventures forth to new territory, becoming an open world third person action RPG. Due to the action oriented gameplay, combat seems to be super interesting at first, as Noctis can use up to 4 different weapons at one time and even switch between them mid combo. Different monsters are weak to different types of weapons, which include great swords, polearms, swords, guns, shields (!) and even dual blades (my personal favourite). Noctis can teleport over a short distance and deal devastating blows with any of these weapons to the enemy’s blind spot and this is extremely satisfying. Combo attacks with your teammates can be initiated at times, and as you land more blows, the link strike bar will fill up and you will be able to use your comrade’s special skills. These skills vary in effect, as some can regroup and heal the team, while others deal monumental damage to a single enemy target. Warping to nearby rest points is also possible, as you can then recover HP and MP and re-strategize your plan of attack against tougher foes. You can phase through monster attacks at the cost of MP by holding the Square button and counter attack after a brief animation (widely known as Quick Time Entry) by holding the circle button. While at first the combat was fun and engaging, its charm wore off quickly on a seasoned gamer like myself. Almost every major boss battle is a QTE enabled sequence, which is really disappointing, as some of them had been built up as an epic showdown. At times, it feels like all that you are doing is holding down the circle and square button. There is no effective depth in combat as the game progresses. Sure, Noctis gains the Armiger ability (the limit break skill mandatory in every FF game) and the power to summon Astrals (your Aeon equivalent) mid game, but combat remains the same. That sense of wonder and discovery when you unlock new powers was not present (at least for me) and the game is devoid of any combat development bar the few inclusions I mentioned above. Controls wise, it will take some getting used to as you twiddle your thumbs about trying to chain warp strikes and phase through attacks. The lock on system is one of the worst I have experienced in any game as it is particularly erratic. Speaking of erratic, the camera movements might give you a headache if you warp frequently. The bad lock on system in tandem with the crazy camera dampens the initial stage of fun during combat, though this issue has been largely addressed by the 9GB release day patch. Magic in this game is limited to 3 main spells, namely Fire, Thunder and Blizzard. You can craft these spells with other items that you discover in your travels in order to increase its potency as well as add interesting effects such as increased experience gain or imbue the spell with poison. Despite the ability to deal great damage, magic can backfire on you as it has friendly fire, which means if you cast Blizzaga, all your team mates are going to be covered in frost and will be shivering for the next 10 seconds or so. You have to actively store magic from specific harvest points, which makes magic in this game feel like an item. There is no variety to your spells unlike previous FF games, which had Bio, Haste, Shell and Protect, and thus, magic feels like it is entirely forgettable. While the Astral animations are great, you can’t really summon them at will since they are gods in this game. Though it is a great concept that compliments the flavour of the game, at times it can get tremendously frustrating as I was nearly killed by a level 85 Psychomancer and none of the Astrals decided to help me. However, when I was beating up some low level flans in the game (which I have no trouble handling I assure you), they graciously provide their assistance. Bah, humbug. At times, the game feels like it has outdone itself with brilliant gameplay additions like the occasional Metal Gear Solid like stealth missions and Monster Hunter side quests, where you have to hunt down enormous beasts by breaking their body parts and exploiting their weakness. However, in other instances, it feels like a big mess, especially in one chapter where you will literally be forced into a Resident Evil setting, stripped of your flashy powers as you run back and forth looking for keycards. Travelling in this game is mostly a miss. In the early stages of the game, you need to drive to all your destinations, and it is great as you get to see the wonderful scenery and the lifelike banter between the 4 friends. You will also acquire a chocobo fairly early on, allowing you to traverse areas you can’t access with your car. However, later in the game, the driving time gets longer and longer, and the fast travel option takes you to the loading screen, which is really time consuming. Leveling up is unique, as you will have to rest in hotels or camps to accumulate all your experience points. The element of cooking status boosting meals that also grant various buffs adds another layer of strategy which I thoroughly enjoyed. Tied closely to leveling up is the ascension grid, (similar to the sphere grid in FF X) which allows you to customize your party members by focusing on their specialties such as fishing, photography and cooking. I love fishing in this game. Like seriously. Post-game is where FF XV really shines though, since you will be able to access the most difficult dungeons and acquire the best weapons in the game. A truckload of side quests await you once you have finished the main game, but what I feel severely lacking is the connection to these side quests. Most of the time it is go to A, do B, report back to A and it gets tedious real quick. 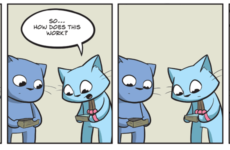 Luckily, I enjoy a grindy game, but there are others who would not want to trudge through meaningless side quests. Before I forget, this game is riddled with bugs despite the day 1 patch and there is also no bestiary. Really SE? Really? Verdict: Great in the beginning and then dive bombs to mundane as you keep playing the game longer. The backbone of every Final Fantasy game I have ever played has always been the storyline. Be it the pilgrimage of Yuna to defeat Sin, or Squall’s ultimate battle against Ultimecia in a bid to protect time itself or the infamous rivalry between Sephiroth and everyone’s FF hero, Cloud, the story always pushed something unique to its fans. This installment is no different, as it offers plenty of new themes and symbolism in its rather straightforward plot. A tale of 4 friends on a road trip as one of them is about to get married is as refreshing as it gets for the FF series, as most of it has a very serious setting or is heavily based on romance. The concept of the overall story is great, and that is all I can say without stepping into spoiler territory. While Noctis is a quiet character who is usually reserved, as the game progresses, you can see how his behavior changes, and this is reflected in his speech pattern. Prompto, the sanguine class clown of the group is full of childish antics and will not stop jabbering, meanwhile Ignis holds the team together through his analytical tactics and cooking prowess. Gladio is a brute, strong and harsh, showing little or no tact when it comes to areas regarding sensitivity but I’ve caught him enjoying a book during long drives. These 4 brothers in arms are developed well throughout the game, but I feel that more could have been done and unfortunately, this is where the good part ends. In the beginning half of the game, despite disaster striking, the lack of urgency was overwhelming for me. 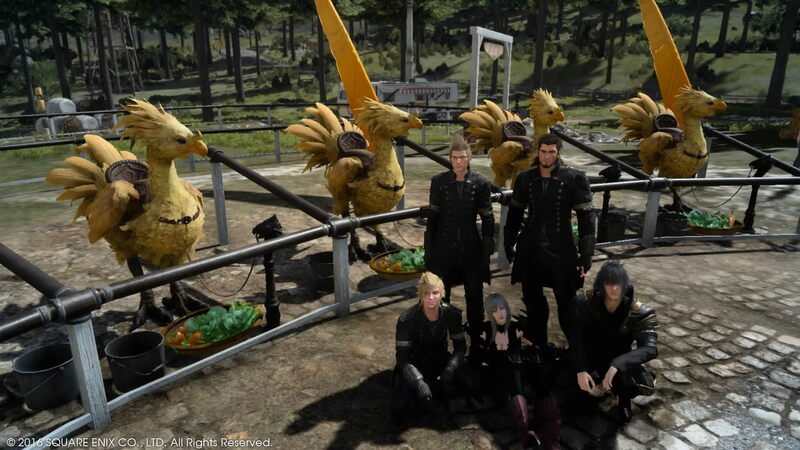 I would definitely not participate in a chocobo race if I knew my kingdom has just been obliterated by an enemy faction. Major events are not given enough emphasis and when the story does lock you down, it takes a headfirst plunge into chaos, not to mention the lack of cut scenes does not push the story forward. The objective of your mission also changes quite a bit from meeting your fiancée, to collecting mythical weapons, to communing with gods to acquire their favour. The presentation of the narrative totally butchers the potential that the storyline has and ruins the hard work that the writers put in. If you skip side quests and focus on the main story missions, I doubt it would take you more than 24 hours to finish this game. Major characters have little to no development, despite an absurd amount of screen time. Case in point is Lunafreya and her brother Ravus, both of whom I really want to like, but can’t because they seem like my 5th removed cousin’s uncle. Directly contrasting this is the side characters, which are so likeable, but is given very little time in the game itself, such as Iris and Aranea Highwind (my favourite in this series). There is also no recruitment of new party members throughout the game, unlike previous installments. I honestly feel that the pacing and explanation of events in this game mirrors that of Star Wars 1-3. Instead of showcasing how hopelessness, sorrow and being cornered lead Anakin to become the iconic Darth Vader, they showed him to be angry at the world for no good reason. 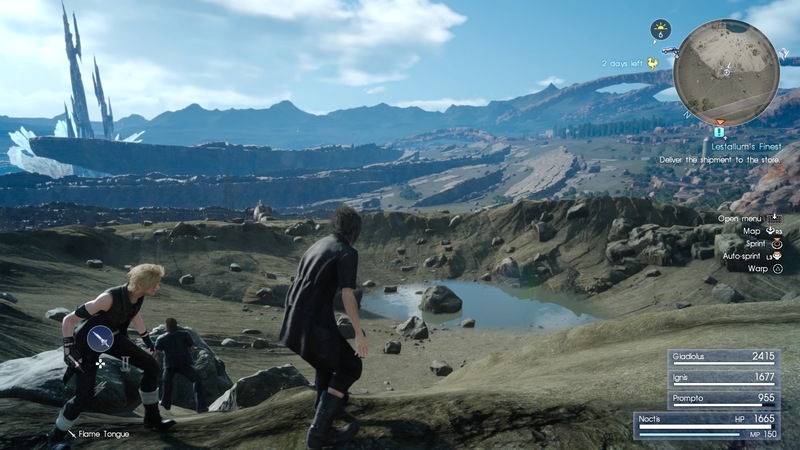 I make this comparison because FF XV focuses too much on areas that doesn’t mean much in the long run, and pays no attention to little aspects that would have made this title an instant classic. At times, I was in disbelief in the plot advancements, predominantly because it was so jarring. Even with the inclusion of a feature film and 5 episodes of Brotherhood, the overall character development and plot progression is dismal at best. The events of the Kingsglaive movie should have been included in the game itself in my opinion (which is always right). SE announced a payable season pass that focuses on Prompto, Gladiolus and Ignis will be available at a later date, but I find this highly unacceptable. Paying for character development, which should have already been included in the core game itself, is obnoxious since SE already had 10 years to plan for this. Verdict: Great overall idea but the execution is one of the worst I have seen in my life. So, after that lengthy review, we have to address some crucial questions. Did I enjoy the game? Absolutely. Is it a good game? Positively. Is it a great Final Fantasy game? Not really. Is this the Final Fantasy game fans have been patiently clamouring for over 10 years? No. If you discount the title of this series, and also the marketing juggernaut SE is, this game would not be received in positive light. While I like this game, it doesn’t belong with the other greats this franchise has produced over the years. However, with this installment, FF is finally relevant again in the world of RPG. Now all they have to do is make Final Fantasy great again. 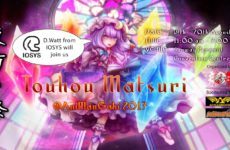 Her Majesty’s Mansion Returns With A Magical Twist – Enter Elemental Bytes!